This is a gorgeous production of Handel’s little-known opera about the loves of the ancient Persian king. In real life he seems to have been – if Herodotus is to be believed – ever so slightly off his rocker. Here he’s your typical romantic hero, though perhaps more headstrong and arrogant than most. 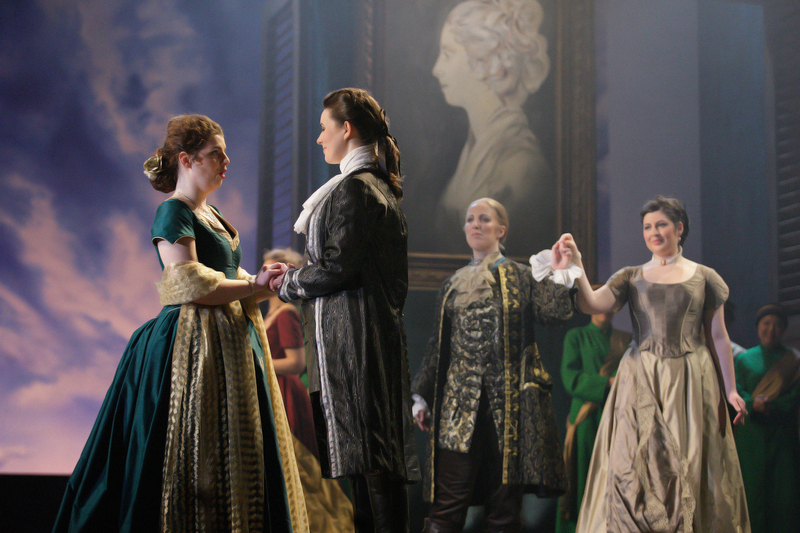 The music is wonderful – all very jolly and jaunty, in Handel’s best style – and the three principal characters – Xerxes (Hanna-Liisa Kirchin), Arsamene (Sophie Goldrick) and Romilda (Aimee Toshney) – are given enough arias to make their feelings known. It’s an absolute pleasure, all the singing. Sets and costumes were resplendent, especially the dresses; they were like shimmering sunlit-clouds: fluffy, frothy and floating. And as a cherry on top there was Eleanor Garside’s performance as Atalante, a girl who lands on her feet at the end, free to flirt another day. Garside makes of Atalante a fine comic creation, a young woman who treats love as an amusing game, and you don’t get many of those in your average opera. Off she goes fluttering her fan, indefatigable. Xerxes is showing again tonight and then later in the month on the 29 and 31 March, further details are here.